During CO.STARTERS, you’ll develop and fine-tune your idea, critically examining every part of it and tweaking your next steps through real-time feedback from people in the community. 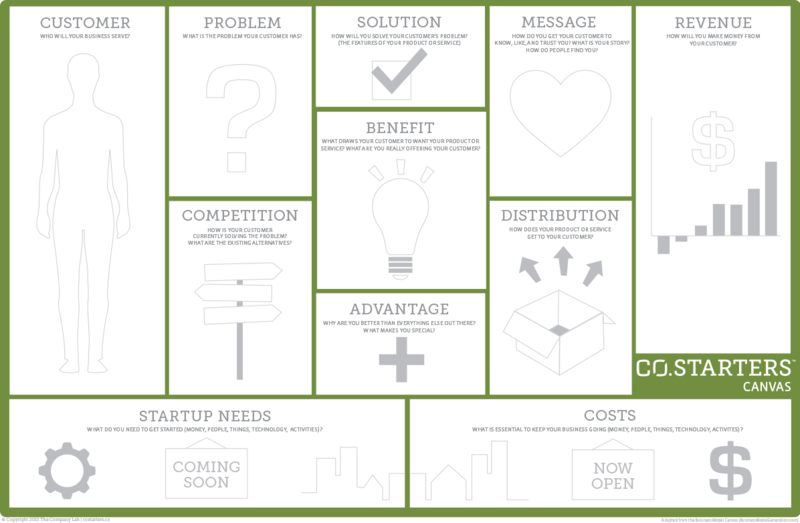 Inspired by The Business Model Canvas, the CO.STARTERS Canvas provides an intuitive visual map to help participants understand, organize and test their business ideas. CO.STARTERS at ConneXion Spot lasts nine weeks, meeting one evening a week for three hours. Facilitators include educators and active entrepreneurs, and guest speakers include specialists and professionals from Castle Rock’s leading marketing, branding, legal and finance firms and agencies, as well as local entrepreneurs. The total course fee for our CO.STARTERS General Session is $1995, which includes course materials, office hours with the course facilitator to address your business development needs, and access to community events, networking opportunities and small business resources. All class participants will receive a three-month Part Time Spotter Membership to ConneXion Spot, including discounts on classes and workshops and discounts with partner businesses in Castle Rock. We are currently accepting applications for the next CO.STARTERS cohort. Dates will be announced shortly. The class will be held at ConneXion Spot, 165 Caprice Court, Unit A, in Castle Rock. Whether you’re an owner of an existing business, or you are simply exploring a start-up concept, you are welcome to apply! You will need a well-articulated description of the product or service you offer (or plan on offering) and a description of your consumer, client, or target audience. We're looking for entrepreneurs that represent a diverse range of sectors and backgrounds, in order to develop a cohort that incorporates both established businesses and startup concepts. We screen our applicants, and space is limited. There is no application fee. If accepted into the program, a 10% deposit will be required immediately to reserve your seat. This deposit applies toward the course fee and is non-refundable. The balance of the registration fee will be due 14 days prior to the start of the course. CO.STARTERS applications are accepted at any time. If you are accepted into the program, you'll be given an option to cite your preference for an upcoming session, based on availability. Space is extremely limited for each session, and spots are first-come, first-served.